If you have a preschooler at your home then I am sure you get loads of kids artwork that your child has created. While you love each of your little one’s masterpieces more than a Rembrandt or Picasso, it is often difficult to think about ways to create an artwork display for these lovely creations. I want to display all the lovely artwork that my daughter creates at school or at home but at the same time I like my house clutter free and organized. Although artwork on the fridge is the usual way to go, I like my fridge unadorned and clean. Trashing the kids artwork is definitely not an option either. So I thought of finding out ways to display kiddie art which will make the kids happy and the mommies proud. Clothespin display It is probably the easiest way to display pictures, paintings, cards and lots more. I remember using these to display Christmas cards when I was a little girl. All you need is string and wooden clothes pin and you are good to go. 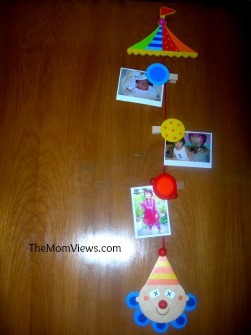 You can also use twine instead of string and up cycle the clothes pin but this is a very simple way to create a kids art display in your house. Wall memo clips If you don’t want to use the plain-looking clothes pin display then these wall memo clips from Vividha are a great option. I have hung these to display pictures, art and even notes from the school. You can choose the clip which will gel with your child’s room and create beautiful wall display. 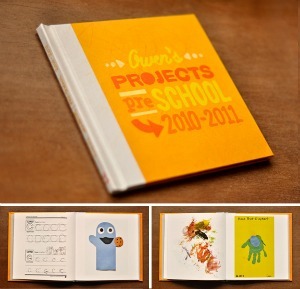 Create photo books Scrap booking is a great option if you want to display your kids drawing to guests in your house. But you can go a step ahead and create digital scrapbooks or photo books with your child’s beautiful artwork. It can be a coffee table book of your preschoolers’ scribbles or a year-by-year book record of your little Monet’s growth as an artist. Transform it Sometimes your kids’ art may not look much like art but more like random strokes of crayons ( brilliant strokes of an artist nevertheless). Especially if you have young preschoolers their art might be a tad bit difficult to recognize ( that’s a girl? Oh of course it is a girl) but that doesn’t mean you can’t display it beautifully. Transform these illegible kids painting into a beautiful work of art with a little ingenuity. Use a template like that of an elephant or a bird and cut the painting accordingly. Voila now you have a gallery worthy painting at hand. Frame it It is a pretty obvious solution to your art and craft dilemma. 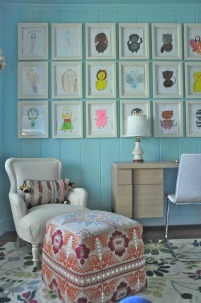 Use different types of frames for creating an art wall in your family room or in your kid’s play room. You can also keep changing the artwork in the frames as your child grows. You can also think out of the box and create creative frames to display the artwork like wire and clips in a giant frame or create a magnetic picture frame. Cute Pinboards You can get lots of different types of pinboards from the market. I have a heart-shaped pink pinboard at home which I use for my own notes and ideas but you can also use it to display artwork. You can even create your own pinboard using this simple tutorial. All you need are rubber bands and cardboard. 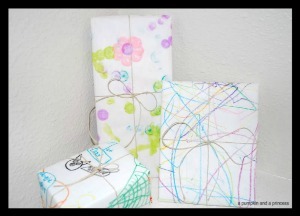 Use it as gift paper You can totally use your kids’ artwork as gift paper for your near and dear ones. I think it not only adds to the emotional quotient of the gift but also adds a personal touch to the gift. 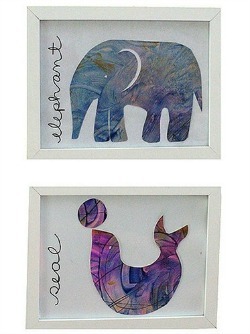 Besides it is also a great way to recycle paper and upcycle kids art. Store artwork with an app Artkive is a great app that lets you store, share and even print out your child’s artwork. All you have to do is to click a picture of the artwork and the app automatically tags the pictures with your child’s name, grade and the date it was created. You can now share it with your close friends and family or keep collecting till you have enough to create a photo book. Take the art with you Look around and you will find a hundred ways to take your child’s art with you. You can get the artwork transferred on mugs, t-shirts, mouse pads, laptop skins and so on. This will be a cute reminder of your child if you are a working mom and your child will love that his artwork is with his mommy all the time. Kids also love to wear their own art so definitely get a painting transferred onto a plain t-shirt. Create a customized calendar At the end of the year you can choose best 12 of your child’s creations ( that is a difficult task though) and print it as a one of a kind personalized calendar for the next year. 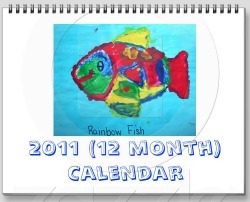 You can create desktop calendars or wall calendars and cherish your child’s master pieces all through the next year.